The latest generation upright from Hoover is their Windtunnel 3 Pet, specifically designed to tackle the unique challenge of keeping a home with one or more pets clean. Animals shed their hair often, but their hair isn’t the only problem. Dander, or dead skin cells also flakes off their bodies and triggers indoor allergies in many people. It takes the right combination of filtration, suction power, and attachments to rid your home of these allergens and that is what this new Hoover is all about. The suction power starts with their Windtunnel™ technology which creates 3 air channels to lift and remove deeply embedded dirt particles from high pile carpets. And their multi-cyclonic interior design solves one of the biggest problems that bagless vacuums suffer from…clogging and loss of suction power over time. The air is passed through 13 cyclones to filter out dust and other debris before it gets to the filters. This results in much less buildup inside and keeps the cleaner operating at peak performance for extended cleaning sessions. A standard HEPA filter will remove almost all of the smallest of allergens including dust mites, pet dander, and pollen from the air as it passes through the filter. The filtration on this upright vacuum cleaner is rated to remove 99.97% of these microscopic irritants down to the size of 0.3 microns which is pretty standard in the industry. The thing that sets Hoover HEPA filters apart is they also contain activated carbon which really helps remove odors as well. This is a great quality to have when cleaning up after animals as it will leave your home smelling fresher than before. Anything you can do to cut down on pet smells is a positive, especially for those who are extra sensitive to those tell-tale odors. The Windtunnel 3 Pet comes equipped with 3 attachments that help clean a variety of surfaces, crevices, or other hard to reach places. The Pet Turbo tool attaches to the extension hose and has a small spinning brush roll to pick up stubborn hair from carpets. 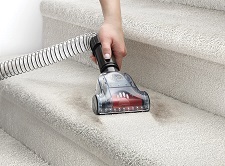 It works great on stairs and upholstery, and it is small enough to fit into tight spaces. The Pivoting Dusting tool is unique in that it can pivot to a 90 degree angle which allows you to clean on top of ceiling fans, appliances, or high cabinets. It reaches where most other dusting brushes simply cannot. The Crevice tool is pretty basic but has a small tapered head that lets you get into corners where the full sized vacuum body is not able to. You can clean your baseboards or anywhere the floor meets the wall with little effort. The Windtunnel 3 weighs in at about 18 pounds so it isn’t the lightest of upright vacuums but it also isn’t the heaviest either. It is solidly built using mostly heavy plastic and metal components but it is not as long lasting as the higher end cleaners like Miele or SEBO. However, it wasn’t designed to compete against them since it is around 75% cheaper to buy brand new. 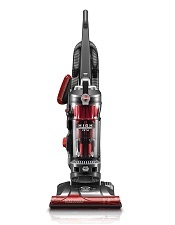 Hoover as a brand competes with the cheaper vacuum brands but stands above most of them on quality. That’s a big reason why they sell so many each year and you see them on shelves in all major ‘big box’ stores. There is definitely an appeal to the majority of homeowners. Should you buy the Windtunnel 3 Pet upright? If you have one or more pets and are looking for an affordable yet highly capable vacuum then the answer is yes. While it doesn’t have fully sealed hospital grade filtration, it does have HEPA filtration that is rated to remove virtually all allergens from the air. And since it is bagless and comes with washable filters, the operating cost is almost non existent. Even if you don’t have pets you will find the cleaning ability to be quite good. In fact, Hoover calls this their best cleaning upright for small and large homes as it comes with powerful suction and all the tools you need for any surface. To check current pricing on their lineup and to read online consumer reviews, click here to visit our recommended ecommerce website.